We have made a number of minor game improvements to give you a better game experience. Enjoy the game and have fun! 25 games - high-quality, full-sized and free – this is Gamebanjo Deluxe! 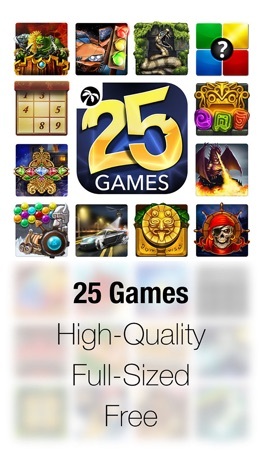 25 most popular stand-alone games in one app! All games are unlocked from the very beginning, so all you have to do is to download Gamebanjo and start playing. Upgrade your houses, vehicles and space ships. Unlock new levels, locations and worlds. Collect bonuses, coins and tokens and progress as far as you can! We are planning to update this app on a regular basis with new games and new content for existing games, so check out for updates. Show me your highscore now! The famous Flappy Chick turns to the dark side and adventure continues in magical space. Stick with 3 simple rules: 1) Tap to get high. 2) Avoid laser beam. 3) Unlock Bronze, Silver, Gold, and *hidden* (easter egg) medals. Once 'Kitty' fly, you can not stop playing! Just tap to fly more and more and more... Avoid obstacles and share your best score! The best game of flap is Flappy Kitty. This app has not relations with "Flappy birds" of ".Gears"